The complementary term 'Moroccan Clash' is often used to describe Hoba Hoba Spirit, a blend of rock rage and hip hop verve boiling along in a cauldron of oriental music since 1998. This quintet from Casablanca is fighting against obscurantism in Arab society with sharp lyrics and popular chorus-slogans that make them the spokespeople for the new generation of Moroccans in search of an identity. 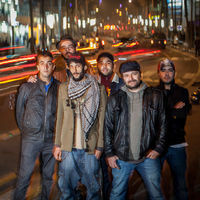 Their lyrics mix French, Arabic and English and their gnaouis-influenced urban fusion sounds place them at the forefront of the North-African contemporary music scene.